Vehicles drive under the Bicentennial boulevard bridge on the Frontage Road along Expressway 83 Friday, August 10, 2018, in McAllen. What’s the story with Bicentennial overpass? 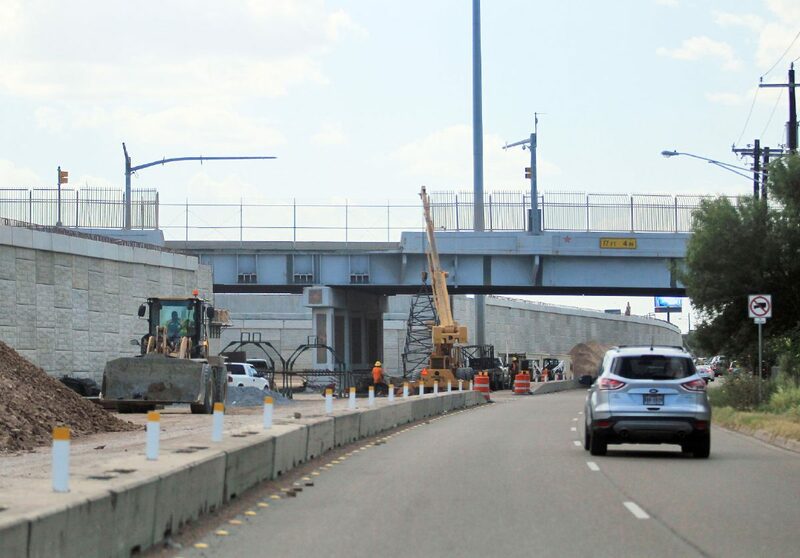 McALLEN — The stretch of Bicentennial Boulevard that passes over Expressway 83 is closed permanently. It will be demolished in the coming weeks, as the state-funded $46 million construction continues on a 3-mile stretch of U.S. 83 from McColl Road to Ware Road. In order to cross U.S. 83 using Bicentennial Boulevard, a popular route to access La Plaza Mall and McAllen-Miller International Airport, motorists will have to wait until at least a year from now. The city of McAllen recommended drivers use 10th Street, 23rd Street or other north-south corridors to access the mall, airport or other northern or southern areas in the city or beyond. Lanes on U.S. 83 will be impacted in the coming weeks by the Bicentennial overpass demolition, but only overnight. Octavio Saenz with the Texas Department of Transportation, the agency running the construction, predicted any lane closures would only happen overnight as the overpass will be demolished in segments. And those lane closures, of which dates have yet to be announced, will not be ongoing for months. When driving north or south on Bicentennial, message boards will divert drivers on detours to avoid the block off overpass. Upon completion, U.S. 83 will cross over Bicentennial Boulevard, similar to how it crosses over 10th Street and 23rd Street. The completed project will increase the capacity for more vehicles and make it a smoother drive for motorists, Saenz said. That overpass, which opened in 1999, has also dealt with serious collisions over the years. Between 2005 and 2010, there were at least five serious crashes, four of which were fatal. This construction intends to smooth the flow of traffic, Saenz said. The entire 3-mile construction is set to be complete in 2020.